The 10 Best Sports Bars in Iowa! With a wide variety of sport spectators in the state of Iowa, ranging from collegiate rivalries to a hodge-podge of professional sport team fanatics, it should come as no surprise that every sports bar in Iowa has its own unique flavor. No matter where you go, what can really make or break your sports bar expectations is the quality of food, service and atmosphere whether your team wins or loses. To get the best sports bar action in the state of Iowa, complete with great entree items, big screen televisions and a friendly place to be, it is worth cheering on your team at one of these 10 best sports bars in Iowa. Classified as an upscale bar experience, thanks to the fun and inviting atmosphere of Briqhouse Bar & Grill, you’re sure to have a good time catching the big game with every visit. That means even if you aren’t a sports fanatic, you can have a good time at Briqhouse. With the full menu of all your favorite entrees and a dedicated game room for pool, darts and playing music on the jukebox, the whole family can enjoy this festive sports bar. The Sports Page Bar & Grill is a full-service restaurant and bar that caters towards the whole family, and can provide the perfect place to catch up on all your favorite sports games. Designated as Spencer’s best sports bar, the fun atmosphere and full menu of this local establishment really bumps it up to one of the best sports bars in Iowa. Whether you are looking to catch your favorite game or find a full meal, Sports Page Bar has everything you need to have a satisfying moment away from home. It should be no surprise that a sports bar in Iowa City, home of the University of Iowa, caters towards Hawkeye sporting events in a spectacular fashion. In between Hawkeye sporting events, Tailgaters is still an awesome place to hang out and grab a drink, have a meal and watch any other sports events that are happening across the nation. Featuring daily specials, a full bar and a friendly atmosphere, Tailgaters could be your next favorite local neighborhood sports bar. Featuring not only the most televisions out of any other sports bars in the Des Moines metro, the Chicken Coop Sports Bar also has some of the best chicken wings you’ll find in the state of Iowa. With all that there to do, see and eat at the Chicken Coop in West Des Moines, you can find a good reason to go even if your favorite sports team isn’t playing on television. Check this place out on gameday however, and you’ll find a packed house and many satisfied appetites. Luck is surely on your side when you visit the Lucky Penny Pub in Hiawatha. While this local spot and neighborhood favorite is undoubtedly a great place to watch the big game, this pub has much more to offer and can keep every level of spectator satisfied with their visit. 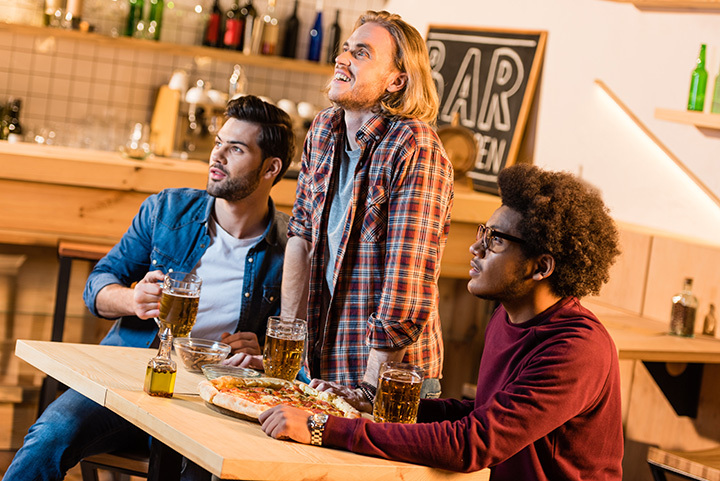 Featuring a full menu of pizza, burgers and the freshest ingredients, plus a casual atmosphere complete with shuffleboard and a full bar, the Lucky Penny Pub can provide some fun no matter how well your team is doing. With two locations across Iowa, one in Le Mars and other in Orange City, P’s Pizza is unique on this list because it doesn’t designate itself as a sports bar. Sure enough though, word got out, and with the combination of wings, sandwiches, craft burgers pasta and of course pizza, plus a comfortable atmosphere and access to all the sports channels, P’s Pizza House just so happens to also be great place to catch the big game. Check out either two locations yourself to root for your favorite team, and see why P’s Pizza House is a fun place to be regardless of who wins. Almost no matter the time of day, T-Bock’s Sports Bar and Grill in Decorah is a great place to catch a bite to eat and grab a little sports action. Open 19 hours of the day, you can opt for breakfast, lunch or dinner at T-Bocks, and with over 20 beers on tap, you can choose from a variety of libations to go with your meal. While T-Bocks does have a plentiful selection of beer, and the interior can be pretty fired up on game days, they refrain from serving hard liquor and encourage every member of the family to enjoy themselves at this neighborhood friendly bar. Located within walking distance to the Iowa State University campus in Ames, Wallaby’s Bar and Grille is a dedicated Cyclone viewing arena on game days. Outside of the sea of red that dominates the floor space at Wallaby’s throughout the football and basketball season, Wallaby’s still draws a crowd thanks to their homemade entrees and award-winning food. Featured on many top sports bars in the nation polls, you’ll just have to see for yourself why they have earned their esteemed reputation. Spectator’s Sports Bar & Grill in Altoona, connected under the Adventureland Resort umbrella, has about 100 different reasons to visit, and each are just as tasty as the next. Featuring unbelievable daily specials like all-you-can-eat fried chicken on Mondays, and a long-list of appetizers and entrees that can satisfy any appetite, Spectator’s might encourage just watching a game, but you’ll still be fully engaged in whatever food is front of you. With a television in every corner at Spectators, not only can you get your hunger pangs resolved with no problem, but you can also get your fix of sporting events at this established sports bar and grill. For a comfortable atmosphere to watch a University of Iowa Hawkeye sporting event, Coach’s Corner in Coralville delivers on all fronts. Not only are the booths, tables and interior decorations perfectly matched towards a comfortable time, but the long list of menu options including the likes of pizza, burgers and wings will have you wanting to stay in your seat for a while. While it is most fun to check out the Coach’s Corner during a Hawkeye game, anytime of the week is guaranteed to be a great time to catch a bite or have a drink at the Coralville Coach’s Corner.